U.S. Wallet Closed As IMF Seeks To Build Crisis Fund At a news conference kicking off the spring meetings of the International Monetary Fund and the World Bank, IMF Managing Director Christine Lagarde said she wants to secure at least $400 billion for a special crisis fund for Europe. Thus far, the U.S. has chosen not to contribute. On the eve of the spring meetings of the World Bank and the International Monetary Fund, the IMF's managing director, Christine Lagarde, says there's a spring wind blowing in a recovery for the world economy. But, she cautioned, there are still dark clouds on the horizon — a reference to the continued threats posed by Europe's sovereign debt crisis. Lagarde says making sure the IMF has the resources to manage that threat is this meeting's top priority. The IMF hopes to double its crisis fund by raising an additional $400 billion in pledges from member states. The financial body sees the fund as a way to help convince investors there will be no more defaults in Europe. It could also be used to help countries, like those in Eastern Europe, whose economies have been hurt by the crisis in the eurozone. In a press conference Thursday in advance of the weekend meetings, Lagarde acknowledged the progress Europe has made in gathering the financial resources to manage its debt problem. But, she said, the IMF needs to participate in that effort as well, "by building additional firepower to contribute to this global firewall that we have been advocating very strongly during these last few months ... As part of the outcome of this meeting, we expect our firepower to be significantly increased." Thus far, European countries and Japan have pledged $320 billion of the hoped-for $400 billion to the crisis fund. But the United States — the IMF's leading member — is keeping its wallet closed. Treasury Secretary Timothy Geithner justified the U.S. position on Wednesday. "What we did not want to see is people [looking] to the IMF as a way to substitute for a more forceful European response," Geithner said, speaking at the Brookings Institution in Washington. "Europe is a relatively rich continent. It absolutely has the financial resources to manage this problem. It's got to play the dominant financial role." But many observers say there may be another reason the U.S. has declined to bolster the emergency fund. They suggest the Obama administration does not want to ask Congress to approve tens of billions in additional dollars for IMF funding during a presidential campaign. There's already a move in the U.S. House of Representatives to rescind a $100 billion emergency credit line the U.S. extended to the IMF in 2009, when the financial crisis was exploding. To date, the IMF has tapped only about $6 billion of that line of credit. 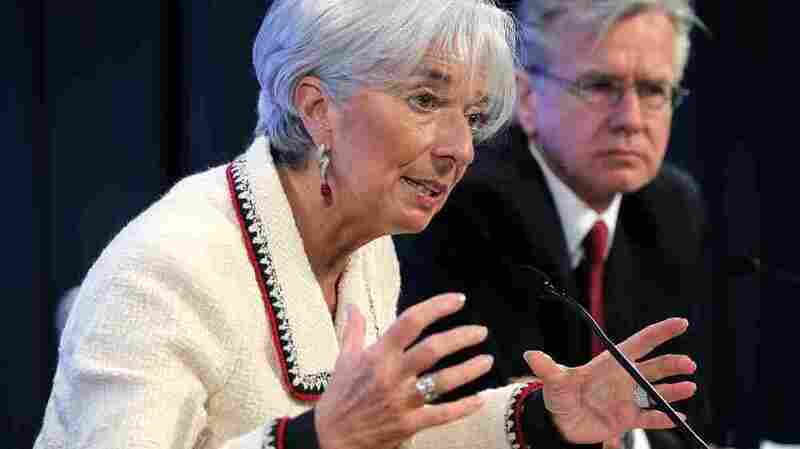 Lagarde tried to reassure members of Congress on Thursday by stressing that loans to the IMF are a safe bet. "It's money that is well managed," Lagarde said. "No country has ever lost money on the IMF." But in his comments Wednesday, Geithner argued the U.S. has done its part to help Europe. "It's a mistake to look at this and suggest that the United States is holding back from, and standing apart from, this broad effort," he said. Geithner said the most important aid from the U.S. has come in the form of Federal Reserve swap lines. These give Europe's central banks unlimited access to dollars in exchange for their currencies, and have helped avert a crisis among European banks who need dollars to meet many of their obligations. Even without U.S. participation in the emergency fund, Lagarde expressed confidence the full $400 billion goal would be pledged by the time the spring meetings close on Sunday.